Definition at line 37 of file llurlsimstring.h. Definition at line 40 of file llurlsimstring.h. Definition at line 64 of file llurlsimstring.h. Definition at line 149 of file llurlsimstring.cpp. References llformat(), mParseState, mSimName, mX, mY, mZ, PARSE_OK, and sInstance. Referenced by LLStartUp::dispatchURL(), and main(). Definition at line 122 of file llurlsimstring.cpp. 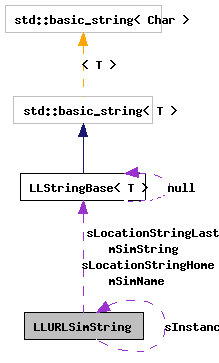 Definition at line 97 of file llurlsimstring.cpp. References mParseState, mSimName, mSimString, mX, mY, mZ, NOT_PARSED, NOT_SET, PARSE_FAIL, PARSE_OK, and sInstance. Referenced by LLURLDispatcherImpl::dispatchRegion(), LLStartUp::dispatchURL(), idle_startup(), main(), and LLURLDispatcherImpl::regionHandleCallback(). Definition at line 77 of file llurlsimstring.cpp. Definition at line 50 of file llurlsimstring.cpp. References FALSE, gSavedSettings, mParseState, mSimName, mSimString, NOT_PARSED, LLPanelLogin::refreshLocation(), LLControlGroup::setBOOL(), sInstance, sLocationStringHome, sLocationStringLast, and TRUE. Referenced by LLPanelGeneral::cancel(), LLURLDispatcherImpl::dispatchRegion(), idle_startup(), main(), and LLPanelGeneral::set_start_location(). Definition at line 164 of file llurlsimstring.cpp. Referenced by LLTeleportHandler::handle(), and parse(). Definition at line 78 of file llurlsimstring.h. Referenced by getURL(), parse(), and setString(). Definition at line 76 of file llurlsimstring.h. Referenced by getURL(), idle_startup(), parse(), and setString(). Definition at line 75 of file llurlsimstring.h. Referenced by LLPanelLogin::LLPanelLogin(), parse(), LLPanelGeneral::postBuild(), LLPanelLogin::refreshLocation(), setString(), and update_dialog_callback(). Definition at line 77 of file llurlsimstring.h. Referenced by getURL(), idle_startup(), and parse(). Definition at line 70 of file llurlsimstring.h. Referenced by LLStartUp::dispatchURL(), getURL(), idle_startup(), LLPanelLogin::LLPanelLogin(), parse(), LLPanelGeneral::postBuild(), LLPanelGeneral::refresh(), LLPanelLogin::refreshLocation(), setString(), and update_dialog_callback(). Definition at line 71 of file llurlsimstring.h. Definition at line 72 of file llurlsimstring.h.